WASHINGTON — President Trump on Wednesday torched a compromise that his own vice president floated with Democrats last month to stave off a government funding lapse, saying $2.5 billion in border security spending was insufficient as he renewed calls for $5 billion for his border wall amid a shutdown that has stretched into its 12th day. He also rejected suggestions from Republican senators that negotiators revive a compromise that would twin border-wall money with legislation to shield young immigrants brought to the country illegally as children from deportation and grant them legal work permits. The comments ahead of a meeting with congressional leaders set back any notion that the shutdown could be nearing a negotiated end. They were a remarkable public rejection of a plan that Vice President Mike Pence broached with Democrats behind closed doors 12 days ago, in the hours before a midnight deadline to avert a shutdown, and which his team has quietly continued to push in the days since. And they confirmed the concerns of Democratic leaders who had privately questioned whether they could trust senior White House officials to broker any compromise that could then be rejected by a mercurial president who has often shifted his position at the last moment, especially when it comes to immigration. “No, not $2.5 billion, no — we’re asking for $5.6” billion, Mr. Trump said during a cabinet meeting, hours before he was scheduled to host Republican and Democratic congressional leaders for a border security briefing in the White House Situation Room. The larger figure refers to the amount Mr. Trump has demanded for the wall, which the House endorsed in a vote last month, but which failed to garner even majority support in the Senate, where it would need 60 votes to prevail. “This is national security we’re talking about,” Mr. Trump said. The president’s blustery broadside underscored the difficulty of forging a compromise to end the shutdown impasse between Mr. Trump, who has dug in on his signature campaign promise, and newly ascendant Democrats, who have refused to embrace the idea of a wall and are loath to consider a politically tricky agreement with a president who might change course at any moment. Besides Mr. Pence, he rejected proposals floated by Senators Lamar Alexander, Republican of Tennessee, and Lindsey Graham, Republican of South Carolina. Mr. Trump’s remarks were the second time in as many weeks that he has publicly undercut the vice president after Mr. Pence had privately assured lawmakers that the president was willing to embrace a compromise. After the vice president told Senate Republicans two weeks ago that Mr. Trump supported stopgap spending legislation to keep the government funded through Feb. 8, the Senate unanimously passed the measure, only to have the president say he would refuse to sign it. Wednesday’s Situation Room gathering, to be held in the secure room in the White House basement where military operations are tracked and other sensitive discussions unfold, was a conscious effort by Mr. Trump and his aides to infuse a sense of national-security crisis into the immigration discussion. It will be the president’s first face-to-face meeting with Democratic leaders since a combative session last month when he said he would insist that any government spending bill include money for a wall on the southwestern border — and would proudly own the consequences if that meant a shutdown. But hours before it began, what was billed as a somber security briefing took on the sharp tone of a choreographed political showdown, as Mr. Trump made his case anew for his wall and charged that Democrats were sacrificing border security to gain partisan advantage in the 2020 elections. “The United States needs a physical barrier,” the president said during the cabinet meeting, comparing the southern border to “a sieve” that allows criminals and drugs to enter the country and facilitates human trafficking. 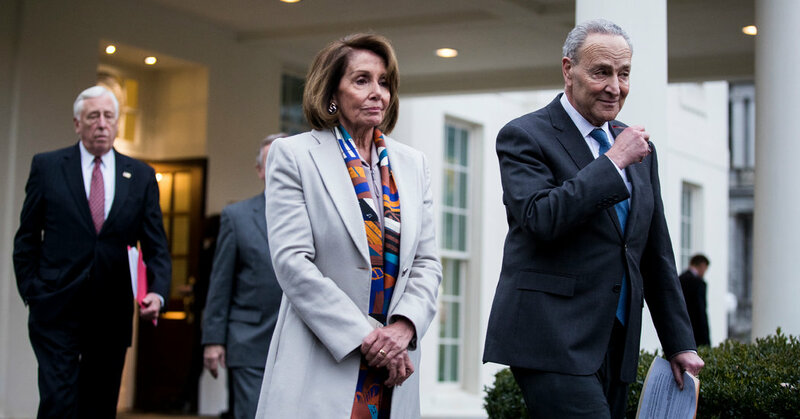 “We are in a shutdown because Democrats refuse to fund border security,” the president said Wednesday, although Democrats have offered billions of dollars for border security, just not his wall. He charged that Democrats were playing politics with an eye on the next presidential election in 2020. Democrats have refused to allocate any money — let alone the $5 billion that Mr. Trump has demanded — for a large, physical barrier like the wall desired by the president to thwart illegal border crossings. Instead, Democrats, in full control of the House, will vote Thursday on two bills to fund most of the government through Sept. 30 and the Department of Homeland Security to Feb. 8. They would devote $1.3 billion for border security measures, such as enhanced surveillance and fortified fencing. But Mr. Trump has called the funding proposal unacceptable, saying that it shows that Democrats, as he tweeted on Tuesday, “do not care about Open Borders.” The Senate unanimously passed legislation last month to keep all of the government funded through Feb. 8, without border-wall money, but the Republican-controlled House refused to vote on the measure. Senior Democratic aides said they had low expectations for the briefing, which they predicted would be a stunt manufactured for dramatic optics with a one-sided presentation from the White House, which would not yield progress toward a resolution of the impasse. On Wednesday, Mr. Trump repeated his false claims about the border wall, including that Mexico was already paying for it, as he promised during his campaign, and that much of its construction had already been completed. The president has puzzled lawmakers and his own aides with his contention that Mexico is financing the wall through the revised Nafta trade pact between Mexico, Canada and the United States, known as the USMCA. The agreement, which has yet to pass Congress, contains no such proviso, and it is designed to lower tariffs, not raise them. And while Mr. Trump claims that the wall is already being built, the Republican-controlled Congress enacted legislation barring any money from being spent to do so, and no such construction has occurred. The Trump administration has spent less than 10 percent of the other border security funding, for fencing and other measures, that Congress provided over the last year. As the shutdown showdown nears the two-week mark and Democrats prepare to take the helm in the House, the search for a way out is getting more urgent. Some lawmakers have grown increasingly anxious about its impact on their constituents, including federal workers who are not receiving pay while their agencies are denied funding. Senator Alexander published an opinion piece in The Washington Post suggesting three ways out: Grant the president the $1.6 billion for border security that he requested, without wall funding, plus an additional $1 billion for security at ports of entry; approve a bipartisan bill linking wall funding with protection for young immigrants brought illegally to the country as children; or resurrect the 2013 comprehensive immigration overhaul that included huge increases in border security measures, sweeping changes to immigration law and a pathway to citizenship for the nation’s 11 million undocumented immigrants. Meantime, incoming lawmakers showed new concerns about the shutdown’s impact. “This morning I requested that my pay be withheld until the shutdown is over,” Representative-elect Mikie Sherill, Democrat of New Jersey, said Wednesday on Twitter, where she posted a letter to the chief administrative officer of the House making official her request. She noted that 800,000 federal workers are not receiving paychecks during the partial shutdown, including thousands in her state. “I came here to govern, not engage in partisan politics at the expense of hardworking Americans,” Ms. Sherill said. Representative-elect Max Rose, Democrat of New York, said he would donate his salary for the duration of the shutdown to a local Staten Island charity, likely a nonprofit counseling charity focused on treating addiction and substance abuse. He said any talk of a broader immigration compromise should wait until the government re opens. “We’re dealing with people’s lives here,” he said in an interview Monday.